The Richie Brace® | Marathon Orthotics, Inc. The Richie Brace® was developed in 1995 by Douglas Richie D.P.M. and introduced to the podiatric market in 1996 after significant prototype testing and modification. The first true podiatric ankle foot orthosis, the Richie Brace® has revolutionized the orthotic industry by providing a new dimension of non-operative interventions for the most challenging pathologies affecting the lower extremity. The Richie Brace® has demonstrated wide versatility in treating sports injuries as well as debilitating degenerative pathologies of the foot and ankle. Since its introduction, the Richie Brace® has been prescribed for over 14,000 patients with extremely favorable outcomes as reported by prescribing practitioners. The success of the Richie Brace® has been largely due to the fact that this appliance contains a balanced functional foot orthotic manufactured according to accepted podiatric biomechanical principles. Extraordinary control of the ankle-hind foot complex is achieved with this functional brace incorporating a balanced foot orthoses articulating with semi-rigid anatomical hinged support uprights. In addition, the lower profile, sport brace design is far more appealing to patients than traditional posterior shell ankle foot orthoses. Finally, the casting procedure required of the prescribing practitioner is a simple modification of the traditional neutral suspension casting technique, already well known in the foot orthotic marketplace. 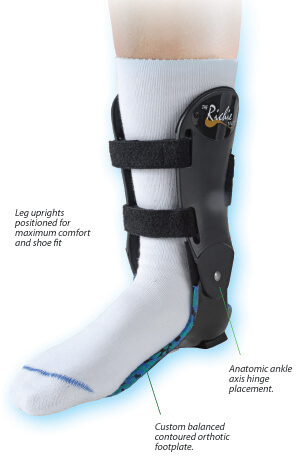 Since its inception, the Richie Brace® has been marketed and distributed by custom podiatric orthotic laboratories. Marathon Orthotics, Inc. serves as a distributor partner and has been crucial to the ongoing success of the Richie Brace®.